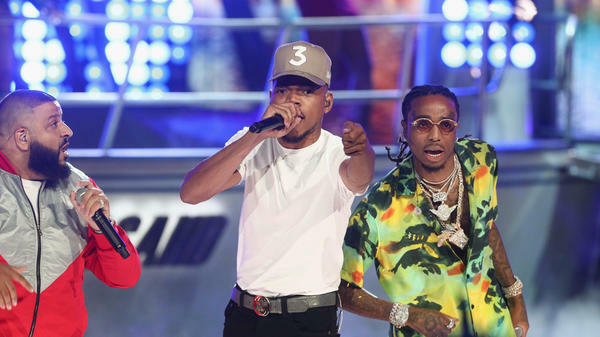 A tweet by Chance the Rapper, shown at the 2017 BET Awards, slamming a racist ad may have illustrated the old adage: "All press is good press." Warning: This post contains language that some people may find offensive. "I think companies are purposely putting out noticably racist ads so they can get more views," Chance the Rapper posted on Twitter after seeing a recent ad for light beer. In it, as reggae music plays, a light-skinned bartender slides a bottle across the bar, past three black people (one playing a guitar), to a light-skinned customer. It ends with the tagline, "Sometimes, lighter is better." The company Chance called out, Heineken, has since pulled the spot, globally. Though it may have been lost amid the noise of media reactions to Chance's recognition of what he saw as the ad's racist subtext, which was then amplified by its subsequent disavowal by the company, Chance's point was a good one. In a statement provided to NPR, Heineken says it "missed the mark" but did not respond to a question about whether the ad was purposefully controversial. In the end, it may not really matter. Could having a Grammy-winning artist pillory your brand for being racist actually be beneficial? As the old adage goes, "All press is good press." In 2014, Adweek looked at a study that suggested negative headlines — for instance, several media outlets reporting that a rap star accused a brand of being subtly racist — have a 63 percent higher click-through rate than positive ones. A recent study from the Pew Research Center found that nearly a quarter of Americans are on Twitter and that more than two-thirds are on Facebook. The combination presents a useful overlap for a brand, even if it is the subject of negative attention — if a "controversy" is stoked on Twitter, and news outlets are posting their articles about that controversy to Facebook, it's reasonable to assume a large audience would be scooped into paying attention to it, relative to the one an ad could have hoped for in the first place. As a 2014 working paper from Harvard Business School titled, "The Rising Cost of Consumer Attention." put it: "Before consumers can be affected by advertising messages, they need to first be paying attention." It later poses the question: "How can brands create ads so compelling that consumers actively seek them out?" Chance's tweet, and media coverage of it, presents one way. Remember: Fyre Festival, that doomed experiment in entrepreneurial and excess hubris, began as nothing more than an expensive social media marketing campaign. Meanwhile, the fuzzy practice of translating the value of people seeing your advertisement versus reading about your company through an article, what is called "advertising value equivalency," is not particularly well-regarded by professionals and has largely fallen out of favor as a metric, according to the Public Relations Society of America. Moreover, advertising value equivalency relies on an outdated equation that depended on comparing the total square inches a brand would receive in a physical magazine and then extrapolating its value based on the advertising rates for that publication. The sweet spot, regardless, would be media coverage of a brand's advertisement — just as Chance pointed out. There are recent-ish examples of a similar situation. Last fall, a soap brand was forced to express, like Heineken, its "regret" over a racially insensitive ad showing a black person washing her skin and revealing it to be white. A year ago, Pepsi's grandiose ad featuring Kendall Jenner was so laughably out-of-touch that its rollout was halted, all but forcing Saturday Night Live to parody it. And on Wednesday, an egregious example from Groupon was added to the pile. In a media landscape with only one common denominator — fragmentation — getting people's shattered attention spans to focus on one place for any amount of time is a win. Even if that win is achieved by failing. "In truth, it might not matter whether they 'meant; to do this or not, when the outcome is the same," writes Ian Bogost, an editor at The Atlantic and a media studies professor, in an email to NPR Music. "The commercial probably had a much greater effect even though it was technically pulled than it might have had otherwise." Bogost had similar thoughts around Pepsi's own experience with failing upwards last year. "It's a trap: Let the ad lie and risk its seemingly racist message to continue," Bogost says, "or draw attention to it and spread the marketing message far further than it would have reached. There's no good move." "I didnt wanna tweet about it so bad ... but its like how can u not," Chance wrote. On Thursday morning, Heineken stock was up — that isn't proof that it was positively impacted by the controversy, but it certainly shows it wasn't hurt by it. Late capitalism is strange sometimes.